Hey all! Very productive week so far. As I type this, I’m waiting on a single, one sentence script change before I can finish lettering the three pages after this one! It’s a small buffer, but it gives me a chance to get the next batch rolling and not die of stress with Briar’s first year of Kindergarten starting up. 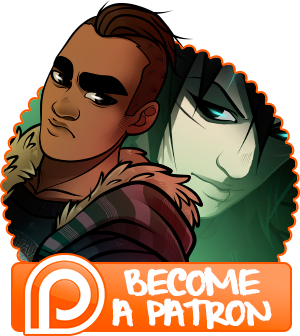 Those three pages should be up for Patrons later today, along with some other stuff I’m working on. Anyhow, if you could all do me the favour of looking at this! Helping out a Children’s Hospital is always awesome, and crushing my buddy in donations is an added bonus. Sketches are for anyone who donates $10 or more!